Molton Brown has launched Mesmerising Oudh Accord & Gold, a new personal fragrance to match the Oudh Accord & Gold body and home collection introduced in 2014. Additional notes for the body products (not verified for the fragrance) include cinnamon leaf and elemi. 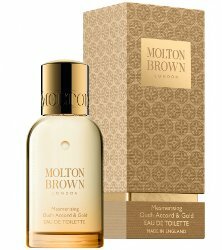 Molton Brown Mesmerising Oudh Accord & Gold is available now at Ludwig Beck in Germany, in 50 ml Eau de Toilette. I don’t think I can support Molton Brown, not that I have ever bought anything from them, but after what Mrs. Burstein justified her use of the word “coloured” at a Jewish Educational Project by saying she was “from the 50’s” while sitting next to John Galliano…I definitely will avoid her products now. It’s owned by a Japanese company now — and they bought it from a private equity company some years ago, I think. So don’t think she has anything to do with it.